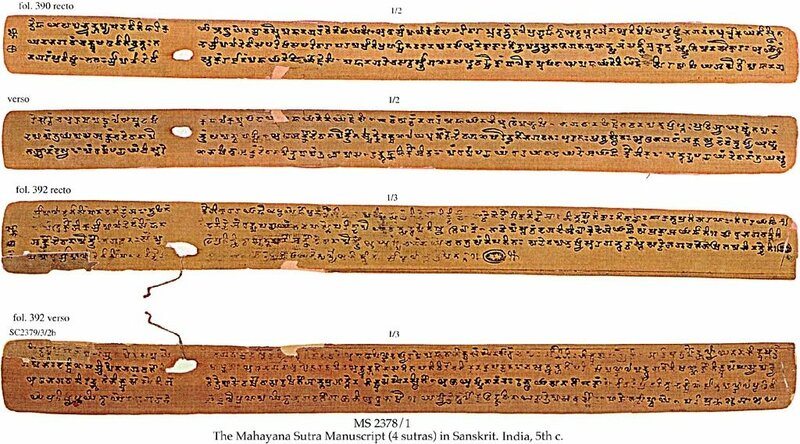 Description	 MS in Sanskrit on palm-leaf, India, 5th c., 5 ff., 30 partial ff., 3 unidentified fragments of originally: ca. 550 ff., 4x38 cm, single column, (3x37 cm), 4 lines in North Western Gupta book scripts. Binding	 India, 5th c., Poti with 1 string hole, dividing the leaves 25 % - 75 %. Context	 MSS 2179, 2372-2386 and 2416 comes from a Library that must have been of considerable size originally, maybe 1400 MSS or more. It probably belonged to a Buddhist monastery of Mahasanghika which was in Bamiyan, according to the report of the Chinese monk, Xuan Zhang (604-662) who visited this monastery in the 7th c. Ca. 60 birch bark scrolls and fragments in Karosthi script in British Library, which according to Prof. Richard Salomon are "The Dead Sea Scrolls of Buddhism" (The Times, 26.06.1996). Similar fragments were in the Hackin collection in Kabul Museum, which was destroyed during the recent Afghan civil war. There are 725 leaves and fragments with similar scripts from this period found in Chinese Turkistan, now in Berlin. The original numbers of this MS was: Text 1: MSS 2378/1/27a, 2378/1/15, 2378/1/1, 2378/1/3, 2379/3/2b; text 2: 2378/1/3, 2379/3/2b, 2378/1/17, 2378/1/34b, 2378/1/29; text 3: 2378/1/44, 2378/1/4, 2378/1/10, 2378/1/17c, 2378/1/26, 2378/1/45, 2378/1/11a, 2378/1/12, 2378/1/17b, 2378/1/32, 2378/1/32b, 2378/1/46, 2378/1/33, 2378/1/40a, 2378/1/41a, 2378/1/42a-b, 2378/uf2/1a, 2378/1/8, 2378/1/34a, 2378/1/37a, 2378/1/36a, 2378/1/43, 2378/1/40b, 2378/1/24, 2378/1/9, 2378/1/25, 2378/1/30; text 4: 2378/1/28, 2378/1/38a, 2378/1/18, 2378/1/14, 2378/1/20, 2378/1/7a+b, 2378/1/11b, 2378/1/13, 2378/1/16, 2378/1/23, 2378/1/21, 2378/1/22, 2378/1/19, 2378/1/5, 2378/1/6, 2378/21, 2378/1/11b, 2378/106; text 5: 2378/1/17f, 2378/1/27b, 2378/1/35. Provenance	 1. Buddhist monastery of Mahasanghika, Bamiyan, Afghanistan (-7th c.); 2. Cave in Hindu Kush, Bamiyan. Commentary	 The original MS is estimated to have contained over 10 Mahayana sutras. Text 1, Srimaladevisimhanadanirdesa, is one of the most famous Mahayana sutras representative of the Tathagatagarbha theory. The original version has be lost. Text 2, Pravaranasutra, has numerous irregular forms of Buddhist Sanskrit terms, and is identical with the Chinese version translated in 381-395. Text 3, Sarvadharmapravrttinirdesa, belongs to literature representing the middle period of Mahayana sutra literature. Text 4, Ajatasatrukaukrtyavinodanasutra, it is the first time parts of this text have survived in Sanskrit. It is one of the small group of Mahayana sutras translated into Chinese by Lokakasema in the late 2nd c. AD. The hoard contains a great number of hitherto unknown Buddhist texts, as well as the oldest surviving MS testimony to some of the most important texts of Mahayana Buddhism. 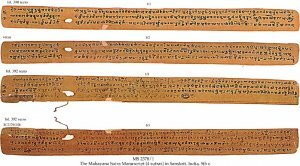 Among these are the by far oldest Prajnaparamita MSS known (2nd-3rd c.) This literature is the earliest scriptures of Mahayana Buddhism. The Mahasanghikas are regarded as the traditional Buddhist school, which first propagated Mahayana ideas. The present collection stands right at the roots of the formation of Mahayana Buddhism, and is its single most important source. Published	 Manuscripts in the Schøyen Collection I, Jens Braarvig, ed. : Buddhist manuscripts, vol. 1 and 2. Oslo 2000 and 2002. Exhibited	 Special exhibition for H.H. The Dalai Lama, Oslo, 8.5.2014.